The Beaver Freezer begins and ends at Oregon State University in Corvallis, OR. Take I-5 Southbound. Take exit 228 for Hwy 34/Oregon State University. Go right (west) off the freeway 11 miles to Corvallis. Turn left at the Hwy 34 By-pass, then right on 15th Street at the first light. Go two blocks to the railroad tracks and turn left immediately onto Washington Way. Take I-5 Northbound. Take exit 228 for Hwy 34/Oregon State University. Go Left (west) off the freeway 11 miles to Corvallis. Turn left at the Hwy 34 By-pass, then right on 15th Street at the first light. Go two blocks to the railroad tracks and turn left immediately onto Washington Way. Take Hwy 34 west towards Newport. After crossing I-5, continue 11 miles to Corvallis. Turn left at the Hwy 34 By-pass, then right on 15th Street at the first light. Go two blocks to the railroad tracks and turn left immediately onto Washington Way. Take Hwy 20 or Hwy 34 east to Corvallis. Turn Left on 15th Street. Go two blocks to the railroad tracks and turn left immediately onto Washington Way. There will be no parking or vehicle traffic allowed at the transition area along 26th street between Washington and Monroe. 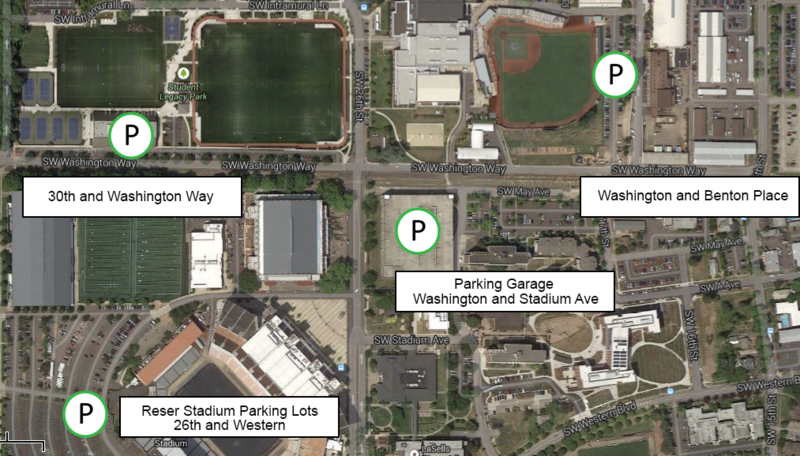 Plan to park in the tennis court parking lot across from Gill Coliseum on Washington Way just west of 26th Street. Parking is available in the parking structure off 26th and Washington (be careful if your bike is on top of your car!). Overflow parking is available in the Coleman Baseball Field parking lot off Washington Way between Benton Way and 15th Street and at Reser Stadium on the corner of 26th and Western. All parking is free. The closest participant drop off area is in the tennis court parking lot. Please be courteous of other drivers and participants. No illegal parking will be permitted.